Do you struggle with setting goals for your company or team? It doesn’t have to be hard—just think S.M.A.R.T.! By filling out this checklist you can strategically set goals to help improve both your leadership and your team’s efficiency. 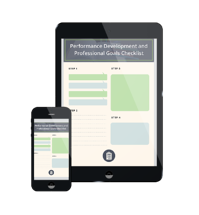 Learn how to increase your team’s efficiency and improve as a leader by setting actionable goals with our Professional Development and Professional Goals Checklist. This 3-step worksheet will help you outline where current goals fall short and teach you S.M.A.R.T. goal setting. Not only is this a simple way to streamline your management by making your goals communicable to your team, but it will help ensure that your team's goals are aligned with the key company (or department) objectives.